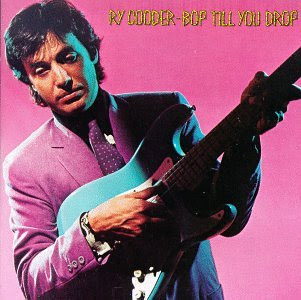 Throughout most of the 70s Ry Cooder's solo albums had showcased an eclectic mix of American roots music forms, blending folk, blues, gospel and more. Following a brief foray into early jazz, he embarked on a new musical path with 1979's Bop Till You Drop. With this album (incidentally one of the first albums of popular music to be recorded digitally) he explored the world of early rock & roll, R&B and doo-wop. In typical Ry Cooder style he re-fashioned an older form of music with inventive new arrangements, all done with great reverence to the original sources. The result was a truly fantastic record, with a modern, urban style yet which echoed with the sounds of the golden days of rock & roll. The songs were mostly covers, both well-known and obscure, including numbers by Arthur Alexander, Jerry Ragavoy and Oliver Sain. The standout songs were a sublime version of the old Elvis Presley hit "Little Sister" (so far removed from the original as to be almost unrecognizable), and a beautiful instrumental reading of Rose Marie McCoy's "I Think It's Going To Work Out Fine". There was also the funky "Down In Hollywood", which Cooder co-wrote with bassist Tim Drummond. Backing instrumentation came from Drummond, guitarist David Lindley, keyboard players Ronnie Barron and Reverend Patrick Henderson, drummer Jim Keltner and percussionist Milt Holland. There was also a vast array of veteren backing singers, led by long-time Cooder collaborator Bobby King (and also including a cameo from Chaka Khan). These singers were given even greater reign than on any of Cooder's previous albums, and accounted for a large portion of the album's unique sheen and doo-wop credentials. With Bop Till You Drop, Cooder effectively re-invented himself, and produced what was easily his most accessible album.